Last night during the retirement of Joe Greene’s #75, it was revealed his was only the second number retired in Steelers history. When they announced the other number belonged to Ernie Stautner, only the real old timers remembered him as a player. 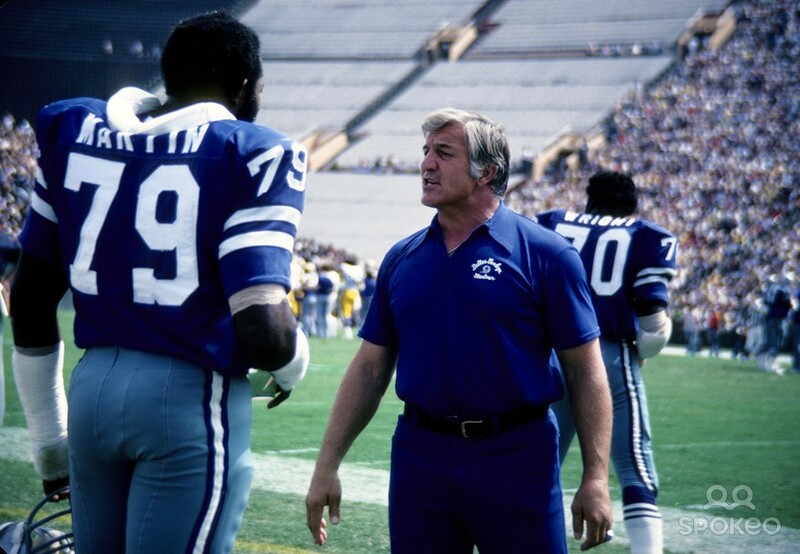 Some knowledgeable Steeler fans would remember him from his days as a defensive line coach for the Dallas Cowboys during the Super Bowl years of the 1970’s. Stautner was a 9 time Pro Bowl DT who eventually made it to the Hall of Fame. 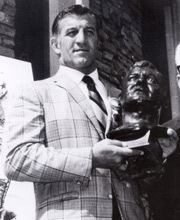 However an earlier incarnation of Stautner was the greatest Steeler during those 42 years of losing before Super Bowl IX. During his 15 year career with the Steelers he was the lone standout as he made the Pro Bowl nine times. Stautner was voted to the All Decade Team of the 1950’s. He was revered as the strongest defensive tackle at the point of attack. In the video you’re about to watch, you’ll see he alternated between defensive end and tackle. He only weighed 235 lbs for most of his career. The same weight as Hall of Fame running back Jim Brown. Yet through his intensity and technique he was the greatest defensive player of the Pittsburgh Steelers first 42 years of existence. Speaking of technique, he went on to be the defensive line coach of the Dallas Cowboys for over 20 years. He taught them all from Hall of Famer Bob Lilly, Jethro Pugh, George Andrie, and on through Harvey Martin, Ed “Too Tall” Jones, and Hall of Famer Randy White. He spanned both Doomsday I and II and only departed once Jimmy Johnson brought his own coaching staff to Dallas in 1989. The late Stautner giving some gameday tips to the late Harvey Martin in 1978. Yet it’s his first NFL incarnation of one of the greatest defensive linemen of his era. He was voted to the Pro Football Hall of Fame in 1969 which ironically was the year the Steelers drafted Joe Greene. This entry was posted in The Soul of The Game and tagged Art Rooney Sr, Dallas Cowboys, Ernie Stautner, football, NFL History, Pittsburgh Steelers, Pro Football Hall of Fame. Bookmark the permalink. ← Arizona Cardinals v Dallas Cowboys: Is Romo In of Out? ?